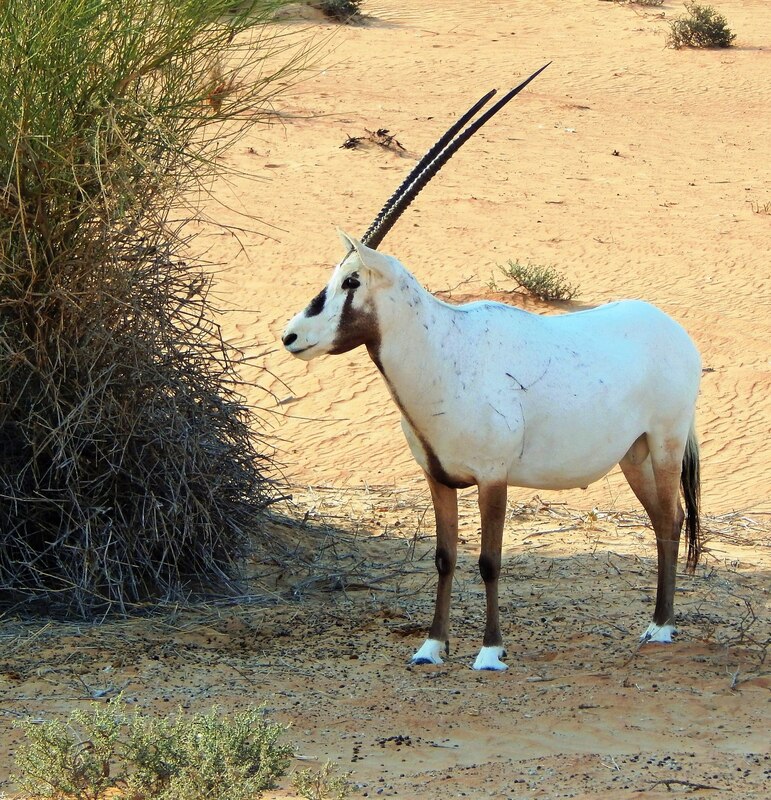 The Arabian Oryx was previously listed by the IUCN as extinct in the wild but was the first animal to have its status lifted to vulnerable thanks to conservation efforts, some of which I wrote of yesterday. (source: Wikipedia) Today they’re listed as endangered courtesy of setbacks in the wild release programs in neighbouring Oman. 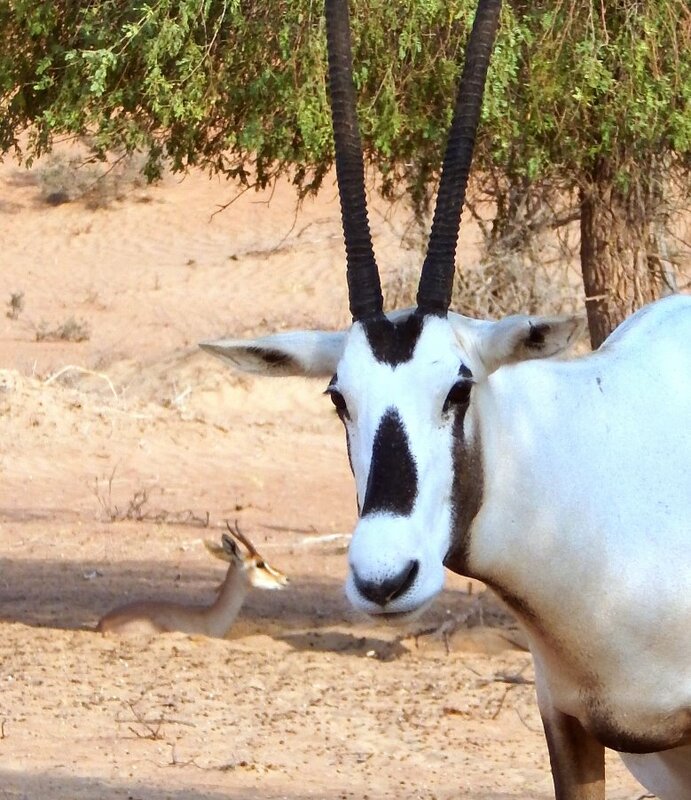 When they’re not being hunted for their valuable hide and horn (now protected but still being hunted illegally), Arabian Oryx are superbly adapted to desert life in both anatomically, systemically and behaviourally. Adaptations for desert survival Despite their many desert adaptations (below) Arabian Oryx are vulnerable to drought due to malnutrition and dehydration. Oryx living in good wild conditions (or in managed conditions) can live up to 20 years. Coat & markings: their luminous, white coat reflects desert heat, and the dark patches below and around the eyes and down the nose absorbs light and therefore helps to minimise glare to maximise their vision. The follicles in their coat are hollow to reduce heat retention. Beneath their coat, their skin is black to reduce sunburn. Nocturnal: Oryx range at night, wandering 20-30km in search of plants which are most succulent after evening humidity. During the day they rest. Placid: Except at breeding time, oryx are pretty chill with each other and this reduces energy spent (and therefore lost) to sparring. They save that energy for interlopers. Rest: During the day they scrape out a divot in the shade of trees or into the side of a tuft of foliage supporting a dune and lie in it. Heat from their body transfers into the (cooler) sand and their low position minimises exposure to the hot, dry desert winds. 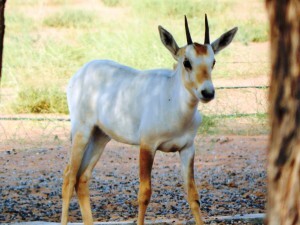 Traditionally, the Arabian Oryx migrate using their super-senses—smelling the slightest hint of rain and then setting off towards it so that they arrive just about the time that the plants begin to bloom in response (which, in the desert, they do very quickly after the slightest hint of water) which is where they get the majority of their water. Within the DDCR reserve, they migrate from bore-fed waterhole to bore-fed waterhole, not for the water, but for the food sources that grow near them. Despite what the very thirsty oryx drinking from my pool would suggest, oryx can go a couple of months (70 days) without a formal drink because they get most of their water from their food—far outstripping the more famous thirst-busters, camels. So the conservation teams working in the DDCR need to tread a careful path between keeping the oryx alive and altering their wild behaviours irrevocably. Panting & perspiring: Oryx have a zillion blood vessels inside their nose which helps to cool the blood that rushes past so that it’s some five degrees cooler when it reaches their brain. This does sacrifice some water through evaporation but a primary adaptation—that their bodies can cope with internal heats of 40C—means the only have to start panting when it’s really hot. Similarly, to save water, their respiration is normal up until 40C and only then will they begin to perspire. This young oryx is maturing and losing its camouflage gold in favour of survival white. Camouflage: Oryx are most vulnerable when they are young and hornless. Juveniles are born with a coat the same golden honey colour of the desert sands which helps them to hide from predators. Reportedly, it was Aristotle who first equated the oryx with unicorns by writing about the ‘single-horned’ oryx some 2500 years ago. Since no fossil evidence has ever been found of a single horned oryx, Aristotle must have seen a real one or a drawn one standing side-on, or perhaps an animal who’d been injured and lost a horn. The earliest bibles refer to a resilient, horned animal called (in Hebrew) re’em and theorists think this may refer to the oryx because reem is defined in literary Arabic dictionaries as ‘white antelope’ and—curiouser still—the 1611 King James Bible directly translates reem as ‘unicorn’. (source: www.saudiaramcoworld.com) . Regardless, there is something numinous (and luminous!) 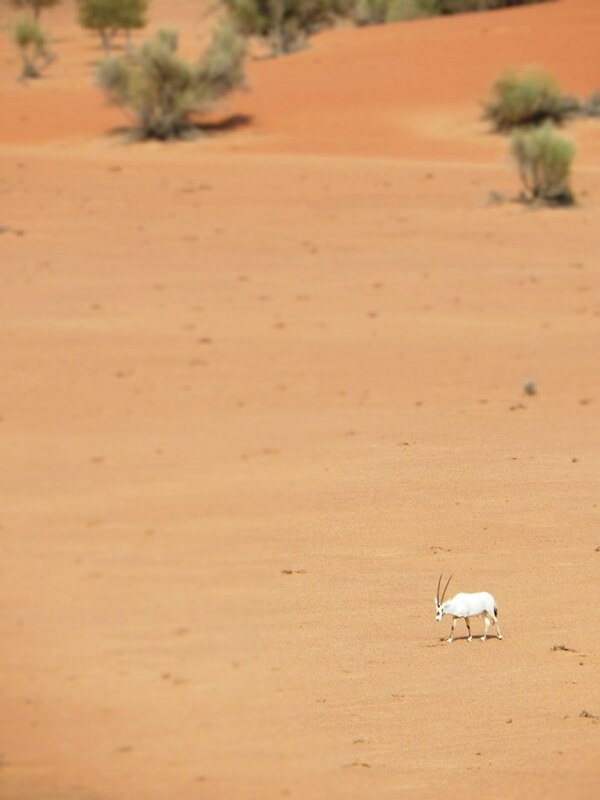 about seeing a lone, glowing white oryx standing out in the heat-shimmery desert so I can kind of see how the mystique grew.